I’m not sure when I first heard tell of it. Probably listening in on the womenfolks’ conversation while sitting on a folding chair in the back of the Century Methodist Church at a Wednesday night fellowship dinner (while scarfing down a paper plate’s worth of sliced ham, fried chicken, Waldorf salad, homemade yeast rolls and Elsie Hare’s green congealed salad made with chopped pecans, sour cream and celery bits). But, of course, nobody ever wrote down the recipe. It was so simple you didn’t need one. Fast forward a half-century or so, and, still haunted by that so-simple cobbler conversation, I’ve Googled “easy cobbler” or some such phrase many times over, but nothing ever popped up that really looked right. Nothing ever seemed like something that fit the bill. Until a couple of weeks ago, that is, when I finally found it. A recipe so simple and so delicious that I have remembered it from the first reading, and have now made it three times – as originally posted, doubled, and “half-agained” – and it is apparently as foolproof as it is scrumptious. Perfect every time. And, this time, I’m writing it down for all of us. I hope you enjoy it. I know your family will. 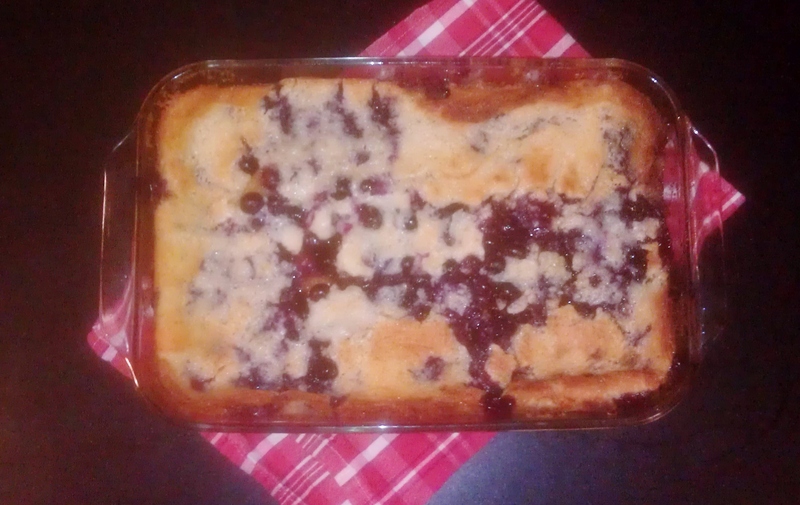 Note: The original recipe is listed as “Easy Blueberry Cobbler” on allrecipes.com, but calls for self-rising flour. It is admittedly even simpler that way, but I prefer to add my own baking powder and salt, so am taking the liberty of claiming this as mine. That said, if you are a self-rising flour person, you can do this with only the five ingredients: flour, sugar, milk, butter and fruit. While butter is melting, sift together flour, baking powder and salt into a medium-size mixing bowl. Then add the sugar to the flour and stir well, then add milk to the dry ingredients and stir till smooth. Take dish with melted butter out of oven and pour batter into it. Sprinkle fruit over top of batter. Return dish to oven and bake for about 45 minutes or until the fruit is set when jiggled. If it still looks wet, it’s not quite ready. That’s it! That’s the whole thing! This may well be the most deliciousness delivered for the least labor ever known. Particularly good with a dollop of vanilla ice cream while it’s still warm. You can thank me later. Love to you all. © 2016, George Thomas Wilson. All rights reserved. This entry was posted in Angels, cooking, desserts, Love, recipes, Uncategorized and tagged blueberry cobbler, deep dish pie, easy cobbler, easy dessert, peach cobbler. Bookmark the permalink. Sorry, Tommy, I could have given you this recipe years ago. I was 10 or younger when my mamma taught it to me. I love this recipe. My sister was taught how to make this in home economics in Moulton, Alabama. It is a great easy dish to serve friends.